Maddie Elliston SCS 2010 is a member of the FIFA U-20 Women's World Cup Soccer Team. She spoke to some of our own students when she was in town. At right, she autographs a St. Cecilia t-shirt for St. Cecilia student Maggie L.
Jim Lindsay SCS 2013 was named a Finalist in the National Merit Scholarship competition. This prestigious honor, in recognition of his outstanding academic achievements, is bestowed on only one percent of the 1.5 million students involved in the competition from across the country. Katie Rourke Gross SCS 2003 is a meteorologist for the National Weather Service. 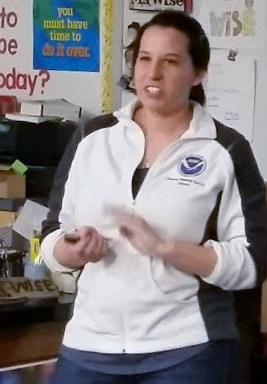 She spoke to the 7th Grade science class about weather and her career. She stated that her interest in weather was evident even in her Junior High Science Fair projects! Several alumni were involved in the Duchesne production of "12 Angry Jurors!" Pictured below are alumni Ian Downey, Alexandra Young, Carolyn Kruszynski, and Cat Swartz. Not pictured - Anna Sully.